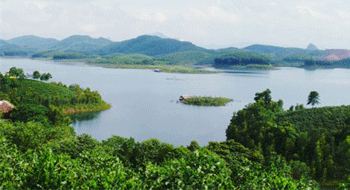 Thac Ba Lake is one of the three largest artificial lakes in Vietnam. The lake supplies water to the Thac Ba hydroelectric plant (the first hydro power plant in Vietnam) in the province of Yen Bai. 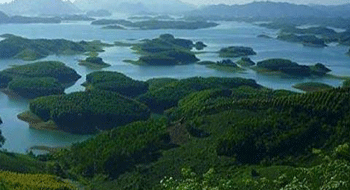 This lake is located 160 km in northwest of Hanoi. Thac Ba Lake was formed during the construction of Thac Ba Hydroelectric Dam which was completed in 1970. With 80 km long, the lake has an area of ​​23 400 hectares but ​​the water surface is 19 050 ha. The depth of the water varies from 46 m to 58 m with 3 to 3.9 billion cubic meters of water. 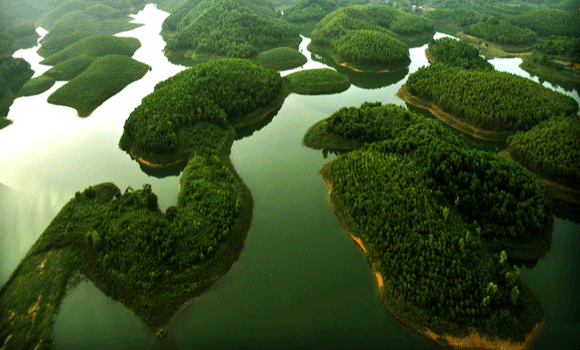 With more than 1,300 islands of all sizes, Thac Ba Lake is known by the poetic natural beauty. Thac Ba Lake is not only known by the beautiful natural scenery but also by the contribution of environmental protection. With annual rainfall of 1700-2000 mm, the vegetation around Thac Ba Lake is really lush. 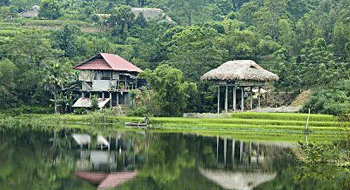 limestone mountains have created here a beautiful system of caves around the lake. Thuy Tien Cave having 100 m long is known by the mysterious stalactites. Xuan Long Cave hides many surprising natural statues in stone. The mountain chain of Cao Bien is the largest in the Thac Ba Lake. From the top, Thac Ba Lake appears in the fog with shimmering beauty. 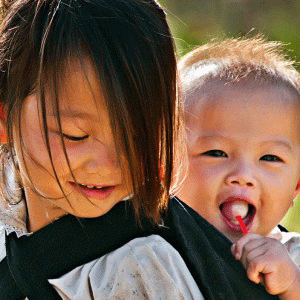 Around the lake, archaeologists have discovered traces of life of Vietnamese in the prehistoric age. Thac Ba Lake is still known by the authentic villages of ethnic groups such as Tay, Nung, Mong, Dao, Phu La, Cao Lan ... where many festivals take place such as: the festival of new rice of Tay people in October when autumn comes, the harvest season arrives, pastoral fragrance covers the village. In the full moon night, the festival of dance of Dao people tells community activities with the folkloric aspects. In Thac Ba Lake, there is no hotel. So it is an ecotourism destination. We suggest at least one night in homestay in a house on stilts, to share life together with local people. The meal accompanied with sake of family in Thac Ba Lake will certainly be a nice souvenir during travel in Vietnam. On arrival at the lake, you'll meet with the family before taking a boat excursion in the lake with stops on the islands... Night in homestay: Comfort is simple but clean. After breakfast, you start our walk in the villages of ethnic groups. 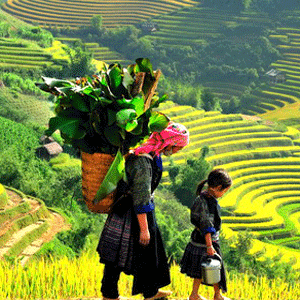 The Dao ethnic group live in wooden houses on stilts surrounded by the beautiful terraced rice fields. This area is little visited by tourists. So this is an opportunity to experience the real local life before transferring back to Hanoi. Your beautiful travel in Thac Ba Lake ends. Option: If comfort is not a problem for you, we offer a trekking day by staying two nights in Thac Ba Lake.